The Morecambe Bay area is justifiably renowned for its panoramic views and stunning sunsets. The vast intertidal landscape and surrounding countryside ensures that this beautiful region retains its ranking as one of the nation’s favourite destinations. 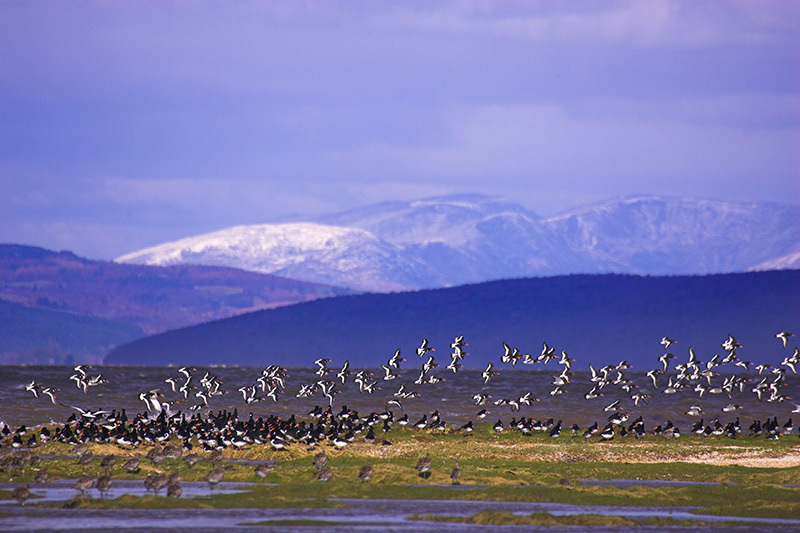 The Bay is also one of the most important sites in Europe for a multitude of birds and other wildlife. Outside of the main breeding season the mudflats, saltmarshes and winding coastal creeks are a haven for tens of thousands of wading birds and wildfowl. Globally significant numbers of redshank, dunlin, knot and oystercatcher can be found here along with pintail, shelduck and eider. The often staggering numbers of birds that gather in the Bay’s intertidal areas come here for one reason alone; a sheer abundance of food. The wading birds find a veritable banquet of invertebrates and marine molluscs in the mud and sand and large concentrations of feeding birds can be found taking advantage of this protein-rich food source. Twice a day the rising tide covers these areas and the birds will form large pre-roost flocks, often performing spectacular aerial displays over the Bay. As these impressive murmurations twist and turn over the water, they often attract the attention of hunting peregrine falcons or merlins. During high tide the majority of wading birds will find a suitable spot to rest until the receding water once again reveals the seemingly endless expanse of mudflats. It is while these birds are gathered in their roosts that they are most at risk from disturbance. Especially during the colder winter months, it is essential that these birds conserve as much energy as possible while roosting and repeated disturbance from dog walkers, aircraft and even over-zealous birdwatchers and photographers can cause real problems for the waders. Away from the coast, the fringes of Morecambe Bay boast a wonderful selection of landscapes and habitats, including areas managed by the National Trust and the Arnside & Silverdale Area of Outstanding Natural Beauty. Local residents and visitors to the area can enjoy discovering miles of footpaths and an array of important nature reserves that provide excellent opportunities for getting close and personal with many of the region’s amazing natural treasures. The Royal Society for the Protection of Birds (RSPB) is not only involved in active conservation throughout the Bay area but also owns and manages large sections of salt marsh and mudflats between the villages of Hest Bank and Silverdale. Here one can find the nature charity’s famous Leighton Moss reserve where wild otters, red deer, marsh harriers and bitterns may be seen. This impressive reserve is worth a visit at any time of year; the various trails and hides allow visitors to explore this protected habitat and its wildlife. As the largest reed bed in North West England, RSPB Leighton Moss is one of the undisputed jewels in the Bay’s formidable crown. Both Lancashire and Cumbria Wildlife Trusts also boast several excellent sites where nature enthusiasts can hope to see all manner of rare and scarce plants, reptiles, mammals and birds. The region’s only grey seal colony can be found at South Walney while nesting ospreys return to Foulshaw Moss each spring. 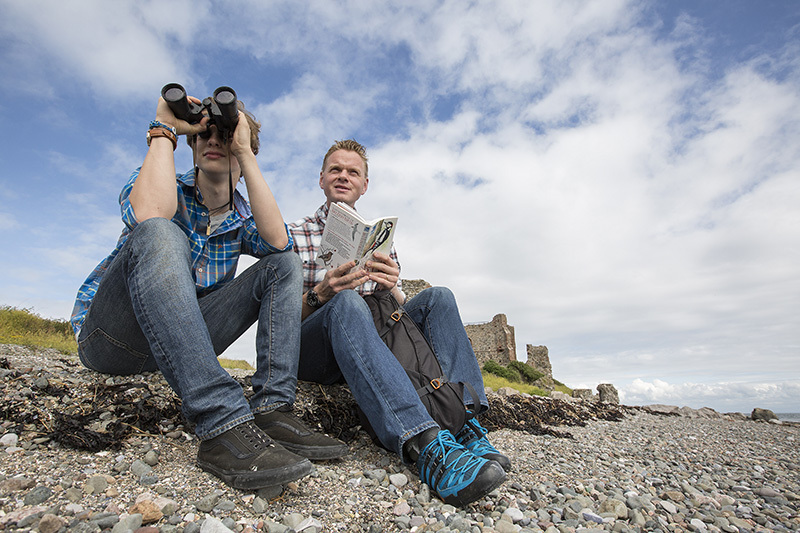 A visit to Warton Crag in the summer months can reward you with a stunning selection of scarce butterflies while spring and autumn is a great time to watch migratory birds at Heysham nature reserve.